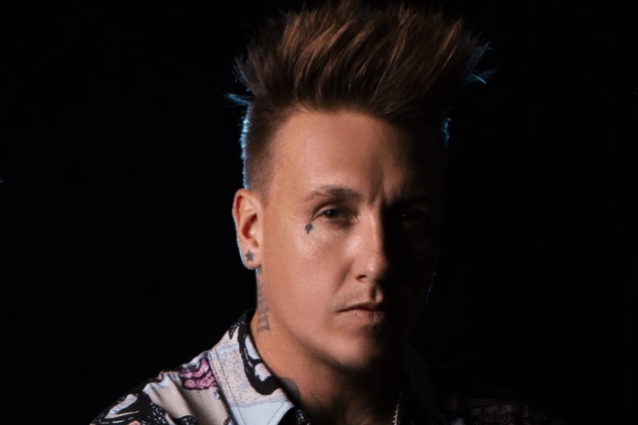 PAPA ROACH frontman Jacoby Shaddix says that "putting down the bottle" was "probably one of the best decisions" he made in his life. Seven years ago, as the band was working on its 2012 album "The Connection", the singer was hitting rock bottom. He had been battling his addictions for a decade, moving from periods where he cleaned up and went on the wagon, only to relapse back into the same behaviors. After the near-dissolution of his marriage and a battle with suicidal depression, the singer is now clean and sober. "That's probably one of the best decisions I made in my life, one of the biggest changes — putting down the bottle," Jacoby told Meltdown of the WRIF radio station (hear audio below). "I'm coming up, actually, in February on seven years of not partying and drinking. And it saved my life. Honestly, I don't think I would still be doing this if I stayed partying. You hear these stories, these tragic stories about these rock and rollers dying at such a young age, and I felt like my clock was ticking. I mean, obviously, we're all gonna go, but I just don't wanna go before my time. I've got so much more to do and so much more to say. I wanna be doing this for a long time. I wanna be a grandpa. I've got all these other things I wanna do with my life that take time. I need it." Shaddix's sober anniversary will come a month after the release of PAPA ROACH's tenth studio album, "Who Do You Trust?" The 12-song disc is one of the most eclectic of the band's career, ambitiously spanning a wide range of sounds and styles. Asked what inspired the making of "Who Do You Trust? ", Shaddix told WRIF: "For us, it's life, man. Life just keeps coming at you like a freakin' curveball. Just when you think you've got it figured out, [you have] your head above water, some other trial and tribulation comes around and challenges us. And so I choose to put that stuff in the music; it gives me sanity. And then also, we've never written and recorded an album during the summertime. We always write and record during the winter, for some reason — just 'cause of touring cycles and stuff like that. And so that, I believe, had an effect on the recording of this record. We were in North Hollywood and we ordered in two tons of sand and had it dumped in the parking lot so we could have a beach in the parking lot. And we spent a lot of time outside on our beach with acoustic guitars and sitting around a fire and writing riffs, and just kind of doing it a little bit of a different way. And it really proved to have a different, I guess, vibe to the record. There's a lot more stuff that's in a major key, so it's got a little bit more of an uplifting sound at times. And that's exciting — that's exciting to kind of take turns like that, and have a record that really takes you on a journey. And this one, I'd say, definitely does." "Who Do You Trust?" was released on January 18 via Eleven Seven. PAPA ROACH will join SHINEDOWN for the 2019 North American leg of that band's "Attention! Attention!" world tour, which also features ASKING ALEXANDRIA.